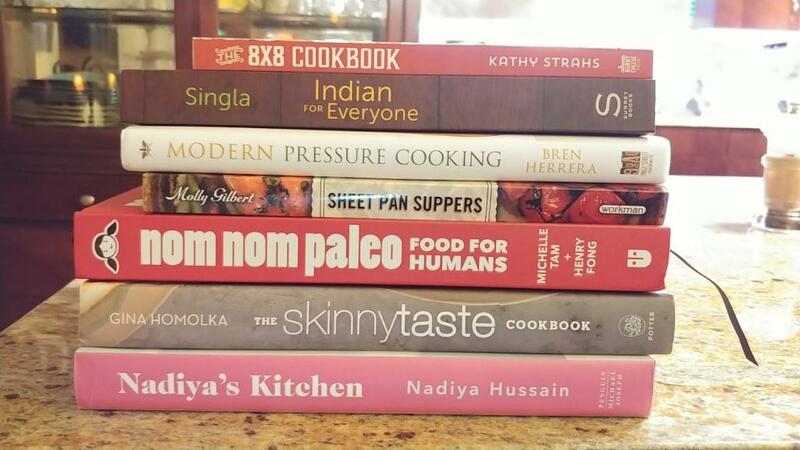 7 of My Favorite, Must Own, Would Recommend Cookbooks (That Are ALL Written By Women)! Generally speaking as my weekends go, Saturday is for play and Sunday is for prep. Sunday is the day to settle down and gear up for Monday. I use my Sundays to recharge, to reconnect, and to plan out the details of my week to come from blog posts to meetings to what I’m cooking for dinner. When it comes to making my grocery lists and meal plans, I settle down and get to work using all of my resources – online and in physical form. I’m talking about cookbooks! I am a bit of a cookbook collector – even though I don’t have enough room for my collection! When it’s time to come up with my weekly meal plan, I start out with a general online search but then I dig deep into my cookbooks. I enjoy the process and it’s a way to find inspiration in the layout and photos, to pore over the techniques and to delight in the prose. Many of my favorite cookbooks, the best in my collection, are by women. Many of these cookbooks, I’m delighted to say – are by women I know personally, admire completely, and would refer to as friends or peers in this miraculous online world where we have managed to carve out our own careers. Recently I found myself sitting comfortably on the floor of my apartment, surrounded by my favorite cookbooks and I realized that I should share these books with you, maybe you’d like to collect them too! Or perhaps gift them to friends who love cooking or who are aspiring chefs themselves. Here’s my list, in no particular order! Nadiya’s Kitchen by Nadiya Hussain – So I mentioned that I got deep into The Great British Bake Off in this post, but I didn’t really confess the levels to my addiction. I got hooked. It was ridiculous. In just a few weeks I mowed through several seasons of the program, and by season 6 I fell head over heels for Nadiya Hussain. She’s so smart and funny and her recipes looked so great! I then fully immersed myself in The Big Family Cooking Showdown and THEN I bought Nadiya’s first cookbook, Nadiya’s Kitchen. It includes over 100 recipes ranging from simple soups she makes for her family, to the gorgeous cake she made for the Queen. It’s British so you will have to figure out temperature and measurement differences often, but it’s well worth a try. The Skinnytaste Cookbook by Gina Homolka – YEARS ago, I was part of a special group of bloggers brought together by a retail brand. One of those bloggers was Gina, and I can report from personal experience, she is awesome in person. Genuine, down to earth, super cool. And her cookbook reflects that personality – it’s thorough, smart, inspiring and real. The recipes are DELICIOUS. There’s a reason Gina’s now got so many cookbooks under her belt – the Skinnytaste recipes are tried, tested and great! Nom Nom Paleo by Michelle Tam + Henry Fong – Michelle Tam is another superstar from the old school blogging community, carving out her niche as a paleo blogger long before the diet was as trendy as it is today. Her cookbook is flat out fun, super cute, and intentionally easy to follow – it uses a comic book style of layout at times and includes many text inserts to explain things as step by step as possible. Even if you don’t follow the paleo diet, Michelle and Henry’s book offers a lot of tips and inspiration for cooking from scratch and making healthy, protein rich meals the whole family is intended to love. Modern Pressure Cooking by Bren Herrera – I spent a long time being afraid of my pressure cooker. Yes, afraid. I had this mental impression that pressure cookers hadn’t fully evolved and were the dangerous cooking appliances of my childhood memories. Even now, I flinch as I adjust the pressure in my Instant Pot, but Bren Herrera’s cookbook makes the whole process much less intimidating. Bren is Cuban-American and her heritage shines in these recipes. If you love Caribbean food and Latin American food and are seeking spicy, yummy fusion recipes, you will love this book. Indian for Everyone by Anupy Singla – Anupy is a powerhouse, especially in the world of Indian cooking and spices. In addition to her awesome cookbooks, Anupy also offers incredible beans, sauces and spice blends for sale via her site Indian As Apple Pie. Indian for Everyone is her third book and it simplifies what only seems complicated, making your favorite Indian recipes for the everyday home chef. Someday I will own my own tiffin and it will be because of Anupy. She’s inspired me to try so many delicious Indian recipes at home and to add her spices to my life! The 8×8 Cookbook by Kathy Strahs – Everyone has an 8×8 pan in their home, but it’s not always used for a range of dishes. For me, that 8×8 for years was pretty much used for brownies and box cakes. Kathy Strahs book showed me that my square baking pan could make everything from appetizers to entrees to dessert. The LA times described it as a wedding gift they’ll actually use, and I’m inclined to agree. It’s a solid purchase for new and aspiring home cooks. Sheet Pan Suppers by Molly Gilbert — Clearly by now you have an idea of my cooking style. Flavorful, adventurous, aspiring to be healthy, and SUPER EASY using things we all have. This cookbook, Sheet Pan Suppers, opened my world to the ease of the “traybake.” If you only use your sheet pans to make cookies and baked goods, you should check this out. You can make such easy, excellent dinners with just a single sheet pan. Thanks for showing me the way, Molly Gilbert! Those are a few of my favorites, some of which you may already know! Hopefully you see some you want to add to your collection! The links in this post are Amazon Affiliate links, and if you shop, you will be supporting Afrobella.com. Click here to visit my Amazon store! Thank you for recommending our cookbook! You are a super star! Thanks so much for including 8×8!! Wow, really wonderful books. I love cooking and I’m surely gonna buy these books. I’m so happy to find these ones. You did a great job. Keep it up!